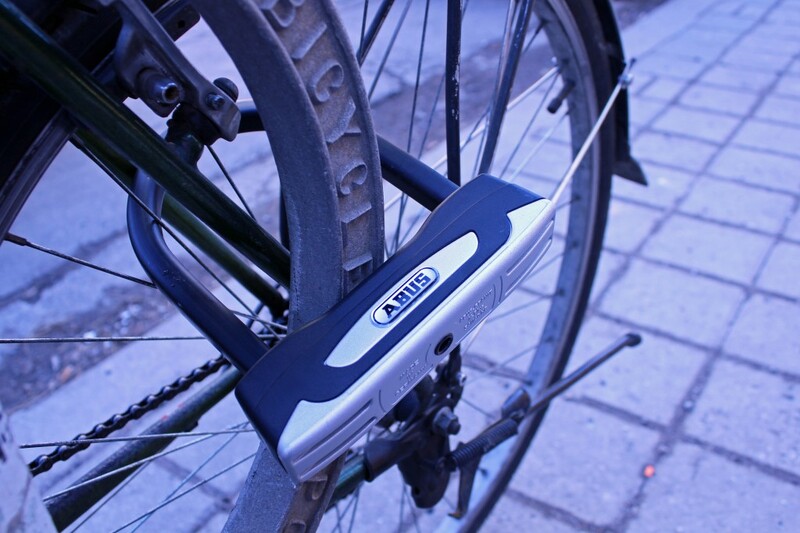 We're giving away some ABUS locks this spring, starting with this U-lock pictured above. Send us your lock-up photos using #dandylocks for a chance to win! UPDATE: Congrats to our ABUS lock winner, Brian Cauley, who sent us an adorable pic of two wee kids bikes locked up with colourful cables. 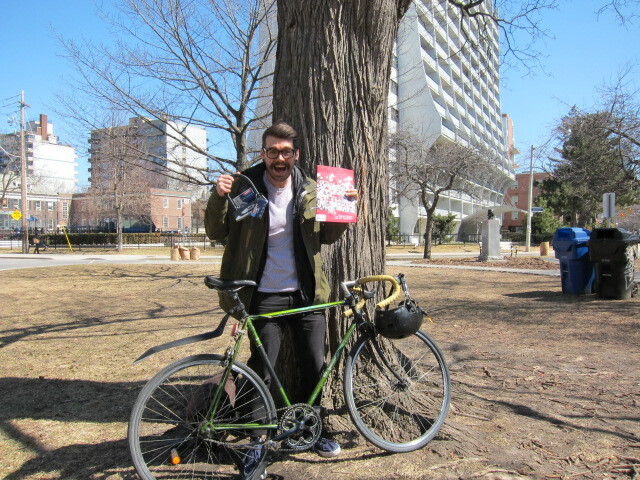 Here's Brian below, holding up his new ABUS mini-U-lock! Congrats again! There is nothing more tragic in the city of Toronto than seeing old bike relics on the side of the street that have been stripped and left for dead. Here are some ways you can avoid turning the love of your life into an old has-been or even losing it all together. Make sure that whatever you’re locking your bike to is sturdy and that thieves wouldn’t be able to somehow get around it. Also, make sure that you aren’t blocking something that may need to be used in an emergency such as a fire hydrant. Usually, designated bike locking areas will be your best bet. Although it may seem hard to believe, wheel theft is starting to become more and more prominent. 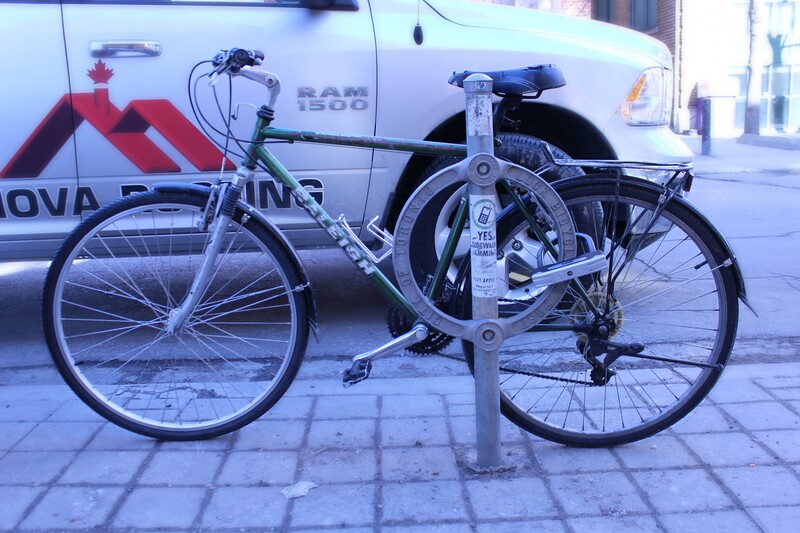 One way to avoid this is to remove a wheel and to put your lock through both wheels, around the frame of the bike and whatever you’re locking it too. This way, all three major parts of your bike are safe. If you’re using a chain to lock up your bike, make sure the links are at least 12mm thick; otherwise, it could easily be cut. Make sure to take any easily removable items such as lights with you when you lock up your bike. Some recommend writing your initials on the frame and on the wheels of your bike since the most recognizable it is, the less desirable it is to thieves. In case you ever have to describe your bike to the police or prove that you own it, be sure to keep a recent picture of you with your bike on your phone. You can also print off that picture and stick it in the seat tube along with your name in order to prove your ownership. Be sure to lock your bike in a safe and well-lit area preferably where there is lots of foot traffic so that someone would likely notice a thief trying to strip your steed. And what should you do if you see someone’s lover not properly locked up? Send us a picture! dandyhorse wants to see pictures of the best and worst bike lock-ups. Send your best, most thorough, lock-up photos along with total lock-up fails post to us on Twitter at @dandyhorse using the hashtag #dandylocks or post them on our Facebook wall (or if you don't use either you can email your lock pic to claire@dandyhorsemagazine.com) along with a description of the general area where you saw the #dandylocks (fail or win) and you could win an ABUS mini U-lock (pictured above). We will be announcing the winner on April 10, so be sure to have your entries in by then. Thank you to ABUS for the lock(s) for this giveaway.